How to get the most out of forex trends? "Just follow a trend", they said. "Buy in an uptrend, sell in a downtrend. It's as simple as it sounds". Everyone who tried trading knows that trend trading is not that simple at all. A quote presumably by Leonardo da Vinci comes to mind: "Simplicity is the ultimate sophistication." In this article we'd like to put together all the tips that make one's trend trading simpler and more efficient. We distinguish two states of the market: a trend, which is a directional movement of an asset to the upside or to the downside, and a range, when price moves horizontally or, in other words, sideways. Here it's all about trends. Let's start with such a plain thing as a trendline. This is a common tool of technical analysis, so common that many traders don't always pay much attention to it as they hurry to use some more complicated instruments. Yet, one has to draw trendlines with care and precision for them to be as helpful as they can. Keep in mind that the main purpose of a trendline is to make the picture on the chart clearer. It's possible to draw many trendlines on one chart and doing so may be a strong temptation for newbies. However, multitude of trendlines will likely be confusing. The goal of a professional is to pick the most obvious ones and work with them: if a trendline is evident, it means that many traders, including large speculators, recognize it. As a result, the odds that such line will hold the movement of a currency pair are higher. A trendline should be drawn at least through 2 points of the price chart and have a bias. The angle of a trend it should exceed 45 degrees (the second point through which we draw the trendline should be 20-30 candles away from the first one). When we put the trend between the two parallel trendlines, we make a trend channel. Such structure allows traders to orient themselves inside a trend. Note that these parallel lines do not have equal power. During an uptrend support line is the main one, while during the downtrend resistance line has bigger significance. It's because a violation of these lines can lead to a reversal. 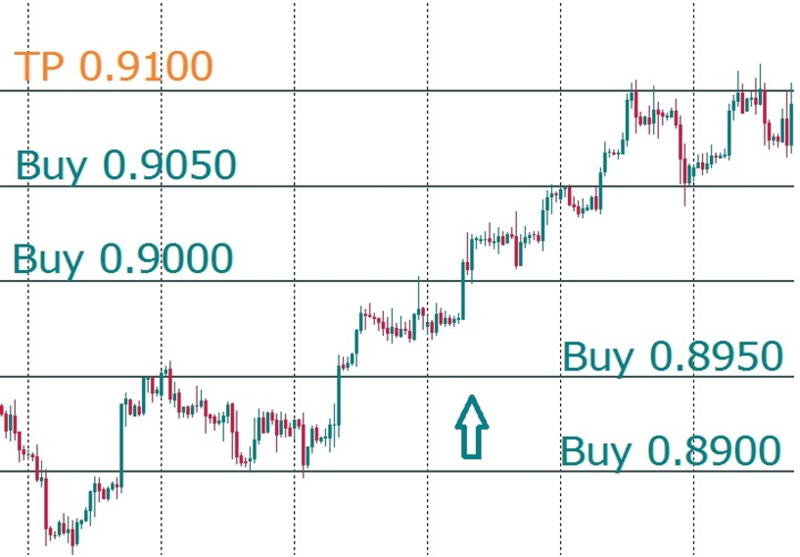 Determine the trend using price action and technical indicators. Study the trend on different timeframes. Plan your entry. Buying on a rebound from a support is less risky than buying on a break of a resistance. Look for chart and candlestick patterns. Don't hurry with opening a position. Be patient and wait for a proper entry time. Limit your losses. 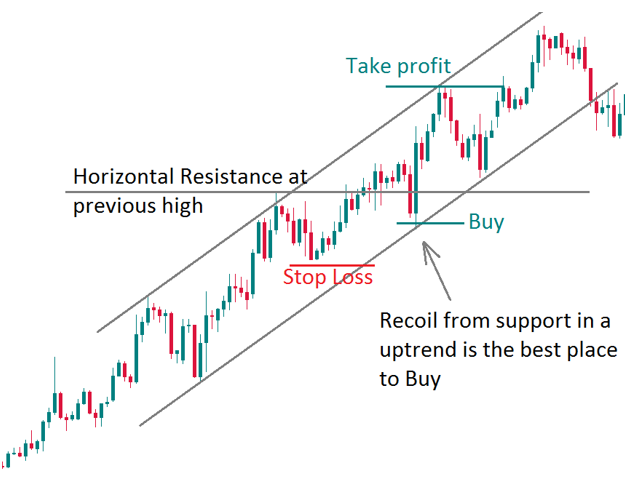 If you are trading an uptrend, one of the solutions is to put a Stop Loss order below the previous low, but you may use other ways of setting a SL as well. It's important to understand that trend trading is a bet that the price will keep moving in a certain direction. If this bet didn't work, there's no point in sticking to this trade. That's why trend traders usually have tight (small) SL orders. If a trade has failed, learn from it and move on. Set your target. We find that it's much better when the target is determined in advance. When your Take Profit is triggered, congratulate yourself with profit. Don't move your TP higher or lower: respect your own analysis and the decision you made when you had chosen your TP. You'll have plenty of opportunities to open new trades in future. TP should exceed SL: risk/reward ratio should start from 1:2. Note that trend trading allows flexibility that can be used to maximize profit and minimize risks. If your you are an experienced trader, you may use such techniques as scaling in (at the early stages) and scaling (at the later stages of the trend). Scaling in means that you enter the market with a smaller position than you usually do (for example, one fourth or one third of your usual size) and then add to this position when the market moves in your favor. This way, if your bet was not correct, you would lose less. If you bet was correct, you would earn more than you would have lost if you hadn't increased your position. A vital rule is to add only to profitable positions and never add to the losing ones. To scale out means to partially close your position as the trend goes in your favor. Trends are not infinite, so gradual reduction in your position size will allow you to stay in the market for longer and not to risk the entire position size. Trailing Stops and moving SL to breakeven also constitute elements of flexible approach to Forex trends. The example of scaling in is represented at the picture below. To sum up, while you should be flexible about some things in trend trading (e.g. managing position size), you should not allow yourself flexibility in other things (no SL moving in case of losing position, no moving of TP). Bear this distinction in mind and let the trading force be with you!